The era of the intercity vehicle is upon us -- I often see oversized golf carts with license plates driving around the suburban Southern California. These are vehicles that can't go on the highway (often they aren't allowed on streets with 35mph speed limits), don't meet federal vehicle crash standards, and instead are classified as NEV (Neighborhood Electric Vehicle) or LSV (Low-Speed Vehicle). In California the requirement is that an NEV must hit 20mph within one mile on a flat paved road, but cannot exceed 25 mph. 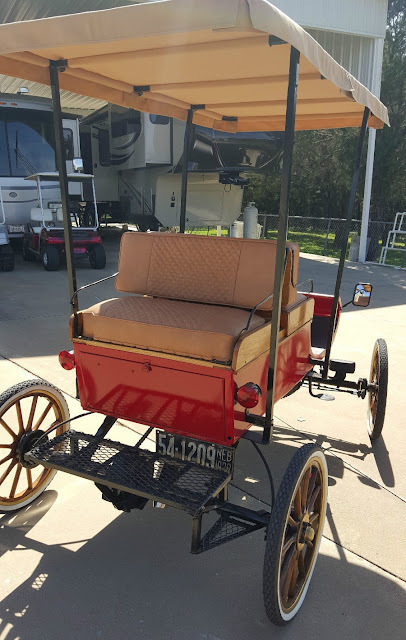 You could head to your local golf cart supplier and find something that can get a plate...or take a walk on the wild side with something like this crazy replica. Find this 1903 Oldsmobile Surrey Replica 1958 Bliss here on eBay offered for $10,000 buy-it-now or make-offer located in Granbury, TX with 2 days to go. 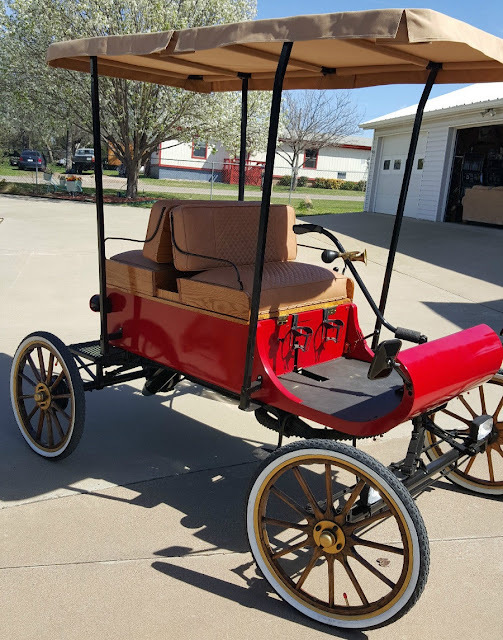 The Curved Dash Oldsmobile Surrey was introduced in 1901 as the world's first mass produced automobile after which it quickly became the worlds best selling automobile, a title it maintained through 1904. However, don't expect to find Model T levels of these things littering the roads; of the 19,000 built the remaining few are worth something to collectors, a fact that was not missed by The Bliss Company of Canton, OH. Bliss started making replica curved dash olds in 1958. With a grand total of 500 built they aren't exactly mass produced, but with technology from the 1950s they are better to drive and easier to operate. 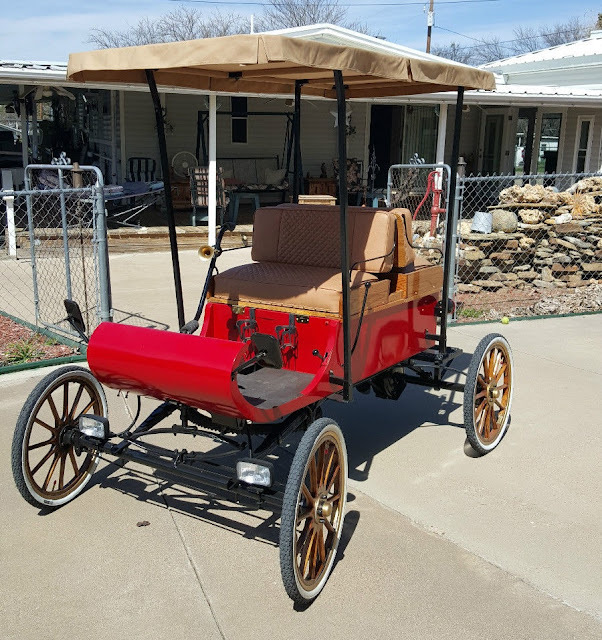 However, you still get the tiller steering experience and two forward gears (plus reverse) hooked into a 19.4 cubic inch single cylinder putt-putt engine good for 8 horsepower. In what manner would one enjoy this? Is this for those wild urges when the Rascal Scooter just ain't gettin' it done? Note to Kids: If I get this old, please "yank the cord like you're starting the mower." Or driving when you feel like being the protagonist of a song. Hey look, nobody's driving, must be one of those newfangled autonomous horseless carriages. There seems to be an element of welded-square-tubing modernity that just doesn't look quite right.